We start off with an unusual match, as this is both wrestlers’ Retirement Match. It was billed as an Exhibition Match so it has a five minute time limit, which telegraphs the ending a bit. Hagiwara was the bigger deal of the two, as she was an actress as well as a two time champion in AJW. 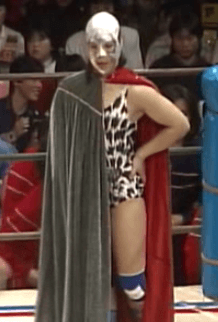 Tarantula debuted in AJW originally under her real name Ito Hiroe, she then wrestled as Wild Katsuki before putting on the mask and turning into Tarantula. Tarantula held the WWWA World Tag Team Championship with Devil Masami but otherwise had an unremarkable four year career. They waste no time as Hagiwara immediately hits a suplex and throws Tarantula to the mat. Tarantula falls out of the ring but Hagiwara sails out onto her with a plancha suicida, she returns to the ring but Tarantula hits a swandive kick followed by a sunset flip. They are making the most of the five minutes they got, that is for sure. Diving kneedrop by Hagiwara and she knees Tarantula before hitting some jabs. Judo throw by Hagiwara as she takes it to Tarantula, but Tarantula hits a nice pair of headscissor takedowns. She pulls Hagiwara out of the ring and slams her into a table, they return to the ring and Tarantula connects with repeated dropkicks. Powerslam by Tarantula but the bell rings as the time expires. The match is a Draw. Afterwards they have a dual retirement ceremony. Just a few streamers and both get flowers before talking on the microphone. Tarantula takes off the mask for her final farewell and they wave to the crowd before leaving an AJW ring for the last time. I will give them credit, they packed a lot into a five minute match. Neither were taking it easy as they were doing dives and high flying moves throughout. The end wasn’t in doubt and I am not sure why they both had their retirement matches against each other, but it was better than I thought it would be. Hard to recommend a match this short but it was certainly action packed. This match is for the WWWA World Tag Team Championship and is a Two out of Three Falls Match. The Dynamite Girls won the titles on June 17th, 1983 against Devil Masami and Tarantula, and up to this match held the titles for over a year. The Crush Gals were one of the most popular tag teams in All Japan Women, as not only were they great wrestlers but were known in pop culture as well as they had several hit songs together. Up to this point they had never held a championship in AJW, and the crowd was hot for them to take the titles from the Dynamite Girls. Nagayo starts the match shooting fire but Omori has none of it so she tags in Asuka to see if she can fare better. She doesn’t, as the Dynamite Girls control the early portion of the match. The action spills out of the ring with Nagayo getting the worst of it, Hori gets back in with Asuka but Asuka knocks her down with a lariat. Double heel kick to Hori and Asuka delivers a missile dropkick followed by a spike piledriver. Cover by Asuka and she gets the three count! The Crush Gals are ahead 1-0. Asuka goes back on the attack as she spins Hori around, then Nagayo comes in and puts Hori in the Scorpion Deathlock. Hori gets to the ropes, Asuka is tagged back in but Hori catches her with a bridging fallaway slam. Powerbomb by Hori and she tosses Asuka over her head. Omori comes in, she puts Asuka on her shoulders and hits an Avalanche Samoan Drop. Diving crossbody by Hori on Asuka, and she gets the three count! The score is now tied 1-1, next fall wins. Omori and Asuka go at it with Asuka hitting a series of enzuigiris, Nagayo is tagged in but Omori gets the better of her and hits a shoulder powerslam. Hori comes off the top with a diving elbow drop, piledriver to Nagayo but she bridges out of the pin. Powerbomb by Hori and she tags Omori and she hits another Avalanche Samoan Drop followed by a headbutt. Nagayo is pulled out of the ring by Asuka so she can re-group but she still is pretty hurt as she is rolled back in, she manages to sneak in a sunset flip but it gets two. Hori gets Nagayo on her shoulders so Omori can dive off the top with a lariat, cover, but Nagayo is in the ropes. Asuka reaches in and manages to tag herself in, and she drops Omori with an avalanche backdrop suplex. Nagayo goes up top but Omori kicks her off, Omori ducks a Nagayo spin kick but she trips as she runs to the ropes. Nagayo quickly grabs her and hits a German suplex hold, and she gets the three count! The Crush Gals are your new champions! This match is part of the Fuji TV Cup League. The real reason this match was included is this was the hot feud in AJW at the time. The Crush Gals as I just mentioned were the hottest team in AJW (definitely figuratively, probably literally) and Matsumoto headed the main heel staple called Gokuaku Domei. Anytime the two groups faced off it was going to be violent, and this match was no exception. Here with Matsumoto is Crane Yu, she debuted in AJW in 1980 wrestling as Masked Yu. Once she unmasked, she joined Gokuaku Domei, and she was also an evil power wrestler like Matsumoto was. So they made a good pair. The match quickly spills to the floor as Gokuaku Domei makes it their style of match, they get back in the ring and Nagayo is double teamed. She manages to tag in Asuka, Asuka clothesline Yu as the Crush Gals get their first advantage of the match. Suplex by Asuka, Nagayo goes up top and they hit an assisted diving elbow strike for two. Nagayo stays in but Yu sends her flying and tags in Matsumoto. Matsumoto gets her spike out and goes to town on Nagayo’s leg, but Asuka pulls her out of the ring. Matsumoto chokes Asuka with a chain and throws her into the ring post before tying her leg to it. Back in, Nagayo kicks Matsumoto twice and tags the freed Asuka, missile dropkick by Asuka and she knocks Matsumoto out of the ring. Yu comes over but Asuka takes care of her also, while Nagayo waits in the ring. Nagayo puts Matsumoto in the Scorpion Deathlock while Asuka does the same to Yu, Nagayo releases Matsumoto and kicks her twice in the head. Yu comes in and drops Nagayo on the top rope, backbreaker by Yu but Nagayo gets into the ropes. Asuka returns and trades blows with Yu, airplane spin by Asuka and with Nagayo she hits a spike piledriver. Yu eats an avalanche backdrop suplex next but Matsumoto breaks up the cover. Nagayo returns and puts Yu in the Octopus Hold, but Matsumoto breaks it up and starts hitting people with weapons. Double lariat by Matsumoto and she lariats Asuka again, piledriver by Matsumoto but Asuka is close to the ropes. She tags in Yu, double underhook suplex by Yu and she puts Asuka in a backbreaker. Matsumoto comes in with a metal bucket and hits Asuka, but Nagayo takes it from her. Asuka starts hitting the referee with a table while Nagayo chokes Matsumoto in the ring with a chain. At some point in all this the referee has enough as everyone keeps hitting him, and the calls the match off. The match is a No Contest. This match is for the WWWA World Championship (held by Yokota) and the UWA World Women’s Championship (held by La Galactica). Since we last saw them these two have faced off again, as Yokota managed to win her title back. But she isn’t done, as now she wants La Galactica’s title too. La Galactica won the title in UWA wrestling as Pantera Sureña, but defends it as La Galactica which I guess is allowed. Double title matches with titles from different promotions have always been rare, so this was a special match between these two rivals. Galactica attacks as soon as she gets into the ring, but the referee calms them down so we can have an official start. They trade strikes until Galactica gets the upper hand and dumps Yokota out of the ring before sailing out onto her with a plancha suicida. Galactica returns to the ring with Yokota slowly following, Galactica puts Yokota on the apron and rams her head repeatedly into the ring post. Galactica puts Yokota in a submission hold, kicks by Galactica and she covers Yokota for two. Tombstone by Galactica but Yokota bridges up, Galactica gets on the second turnbuckle and hits a diving elbow drop for two. Galactica goes for another tombstone piledriver but Yokota reverses it this time and hits one of her own. Yokota goes for a dive but Galactica side steps it, she gets on the turnbuckles but Yokota kicks her to the floor. Yokota rams Galactica’s head into the ring post, and as she gets up you can see blood pouring out of Galactica’s mask. She slowly gets in the ring and they trade strikes, bridging suplex by Yokota and she gets a two count. Yokota puts Galactica on the top turnbuckle and she hits an avalanche double underhook suplex. Cross-arm suplex hold by Yokota, and she picks up the three count! Yokota is the new UWA World Women’s Champion! This collection of matches is definitely top notch. This is somewhat early in the Crush Gals phenomenon and it is crazy how much the fans loved them. Everyone on this show pulled their own weight, with Nagayo being the MVP of the show. With several significant matches, this is a show worth picking up.